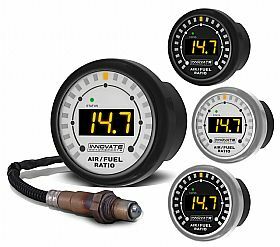 Innovate Motorsports releases the fastest wideband air/fuel ratio gauge available! Innovate Motorsports has announced the release of the new �Digital MTX� wideband air/fuel ratio gauge. The new gauge utilizes Innovate�s patented 100% digital wideband technology that is 180 milliseconds faster and more accurate than the analog technology commonly used by other products. To put this into perspective, at 8000rpm the Digital MTX gauge will see a change in air/fuel ratio 24 revolutions of the crankshaft sooner than all other gauges on the market! Several new features have also been added to the gauge design including an integrated wideband controller for simplified installation. By integrating the wideband controller within the gauge, the 02 sensor can now be plugged directly into gauge without the use of an external controller. In addition, the included sensor is compatible with all popular fuel types and can be quickly and easily calibrated to compensate for sensor wear, changes in atmosphere or other variables. A newly designed gauge body features a weatherproof o-ring seal that protects the gauge from water, dirt, or other elements commonly found around racing vehicles without changing the appearance. To allow for a customized look, each kit includes 2 gauge bezels (black/silver) and 2 faceplates (black/white) that are completely interchangeable. Wideband O2 sensor (included) is compatible with all fuel types including leaded and unleaded gasoline, diesel, methanol and E85. Instant and dead-on accurate sensor calibration. Easy user calibration that compensates for sensor wear and for barometric correction. The Innovate system utilizes sensor feedback to determine when the sensor is damaged. The gauge will display an error as opposed to erroneous data displayed by other systems.